The fresh Broadway tuner Gettin' the Band Back Together has announced an original cast recording, set for release digitally and on CD by Sh-K-Boom Records later this year. The new show features an original score by Mark Allen and orchestrations by Doug Katsaros and Sonny Paladino. Gettin' the Band Back Together follows Mitch Papadopolous, who always dreamed of being the next Bon Jovi, but chose security over stardom and left those daydreams behind for a day job. He dusts off his guitar, gathers his old gang—the math teacher who isn’t good at math, the Irish cop who dreams about being on Broadway, the dermatologist who can’t get a date and a 16-year-old Jewish rapper who makes Vanilla Ice look cool—and sets out to win The Battle of the Bands…and maybe even win back the high school sweetheart he left behind. The cast is led by Mitchell Jarvis as Mitch Papadopolous, Marilu Henner as Sharon Papadopolous, Jay Klaitz as Bart Vickers, Paul Whitty as Michael "Sully" Sullivan, Sawyer Nunes as Ricky “Bling” Goldstein, Brandon Williams as Tygen Billows, Tamika Lawrence as Roxanne Velasco, Kelli Barrett as Dani, Garth Kravits as Ritchie, Manu Narayan as Dr. Rummesh "Robbie" Patel, Becca Kötte as Tawney and Noa Solorio as Billie. The ensemble includes Ryan Duncan, J. Elaine Marcos, Rob Marnell, Jasmin Richardson and Tad Wilson. Gettin' the Band Back Together features a book by Ken Davenport and The Grundleshotz with additional material by Sarah Saltzberg. The show is directed by John Rando, with choreography by Chris Bailey and musical direction by Sonny Paladino. 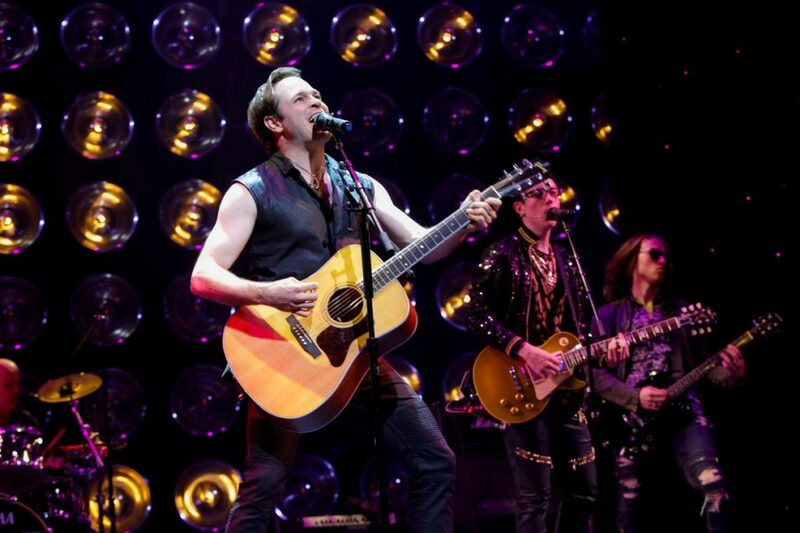 The musical began previews on July 19 and officially opened at the Belasco Theatre on August 13.